As a more task-oriented person, I’ve always had a pretty intentional and structured approach to managing my time. I tend to value time by what was completed within it. I order my next year’s Moleskine calendar in September because the possibility of them selling through the print run and me not having my calendar for the coming year makes me break out in hives. 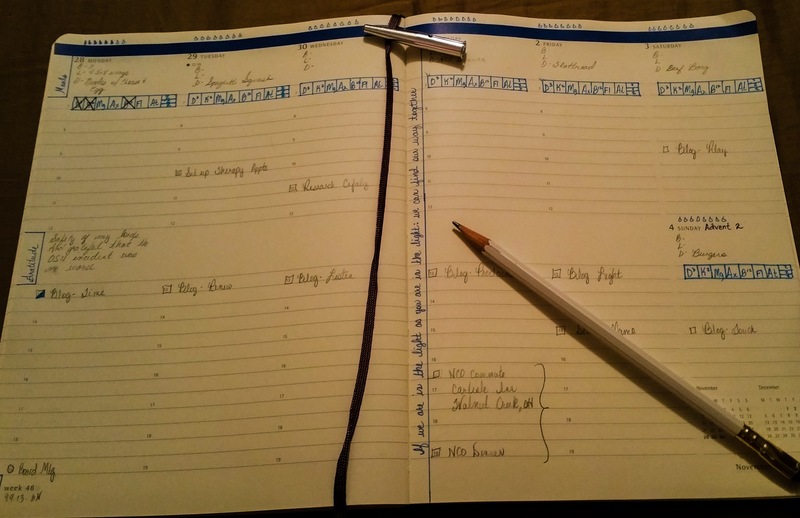 I’ve got a daily, weekly and monthly plan, and every year I do an annual time-block plan – all the major milestones I plan to complete, plugged into a set time frame. I just reviewed 2016’s plan so I could set up 2017, and for the 2nd year in a row I accomplished less than half of what I intended to accomplish with my time. Chronic illness doesn’t play nice when it comes to respecting my time. But the longer I sit in this space, the more I come to understand the the importance and value of slow time. Time that adheres to priorities that I did not set. Time that has space in it to see, to listen, to think. Time that sits in surrender to a purpose greater than my own. Time that has learned to rest in the hope of what will be. Waiting time; Advent.